In a climate of fear and austeria the received wisdom is that you should not be concerned about the size of your pay cheque: you should be grateful to have a job. It is this climate of reduced expectations and hegemonic exploitation that has led to the situation described by a special issue of their journal published today by the Institute for Fiscal Studies, which shows that wages have fallen more in the past five years than in any previous time during our long economic history. As far as those earning wages or salaries are concerned, this is the worst ever recession. Although even I would not go so far as to suggest that the controllers of capital would have provoked a global financial crisis in order to attack the interests of labour, as soon as the crisis arrived they were the first to control the ideological agenda. Sadly, like sheep, most working people and the party that is supposed to represent their interests followed in the wake of the corporate spin-masters, bleating the mantras of austerity and failing to challenge the inequality and economic disintegration that its policies would inevitably bring. 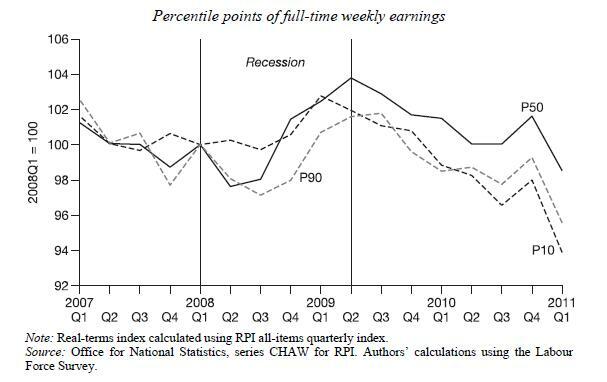 The figure shows that the falls in wages came not during the recession itself but later, during the period of austerity that was caused by Tory policies (P50 is median earnings and P10 and P90 the lowest and highest 10% of the population, respectively). The IFS also show that the effects of the recession have hit the wages of the young particularly hard. This is useful for the interests of capital, since we are now likely to have generations of young people who are grateful for employment on any conditions and grow used to exploitative rates of pay. There is a human side to the story, since the data make clear that those working for small firms are experiencing a degree of solidarity. In harsh economic times employers are keeping staff on, partly no doubt for fear of losing skills; partly for more humanitarian reasons. The longer the government strangles the economy the more these compassionate employers will come under pressure to also dismiss their staff. The IFS conclude that the agreement to reduce wages but keep unemployment low makes this a less severe recession that those of the 1980s and 1990s. I would beg to differ for two reasons. First, the concealing of unemployment and under-employment in this creeping recession reduces the pressure for mobilisation and political change. Secondly, the permanent reduction in the wages of working people will affect current generations for their whole working lives and future generations too. The gains that resulted from the struggles of past generations have been lost and few have the will or the understanding to challenge the loss.